Rapture: According to modern and ancient prophets, there will be no pre-tribulation rapture. At the second coming of Christ the righteous will be caught up to meet Him, but that will be after the tribulations that will come upon the earth, not before. Recommend: In order to attend the temple, a member must qualify for a temple recommend. He or she is interviewed by the bishop of the ward and president of the stake in which the member resides. The recommend is a slip of paper signed by these authorities, and it is presented to elders at the front desk of the temple. A recommend is valid for two years unless some sort of transgression is committed. Special recommends can be issued just for performing baptisms for the dead (at a minimum age of 12 years), and in order to attend a temple dedication ceremony. Record Keeping: Record keeping is highly emphasized in the Church by commandment from the Lord. Exact records are kept of all dealings. Redemption: There are two kinds of redemption: conditional and unconditional. An unconditional blessing comes from God because of the atonement. Christ overcame death, that all men and women will be resurrected. All but the Sons of Perdition will inherit a kingdom of glory in heaven. Conditional redemption is exaltation and comes through a combination of works and grace. Relief Society: A Mormon auxiliary serving the women of the church. They meet together each Sunday and periodically on weekdays for religious instruction. They have a special responsibility to care for those in need and to bring people to Christ. Founded in 1842, membership in the Relief Society is over 5 million. Repentance: The second principle of the gospel after faith. It requires one not just to abandon a sin, but to experience a complete change of heart and to turn toward God with determination to live the gospel out of love for Him. True repentance involves recognition of the sin, asking forgiveness, making restitution, and abandoning the sin. Restoration of the Gospel: After the death of Jesus and His apostles, the world fell into apostasy, which is a general loss of truth and authority to act in God’s name. In the 1800s, God restored the fullness of the gospel to the earth through Joseph Smith. The restoration included: 1) gospel knowledge; 2) the opening of the heavens for visions, revelations, and the ministering of angels; 3) restoration of priesthood power; 4) the coming of Elijah to restore the sealing power; 5) the gift of the Holy Ghost; 6) the gifts of the Spirit; 7) apostles and prophets; 8) the beginning of the gathering of Israel; 9) the restoration of temple ordinances; and 10) the beginning of the establishment of Zion. Returned Missionary: A man or woman who has honorably completed a full-time mission for the Church, in which he or she lived away from home for eighteen months (women) or two years (men) and preached the gospel. Often shortened to RM. Revelation: The process by which God communicates with us. Each person can receive personal revelation to guide him through his own life and responsibilities. Only the prophet may receive revelation for the entire church. Reverence: A respectful and meek attitude not just towards deity, but also in society. Reverence is sometimes wanting at the beginning of Mormon sacrament meetings. 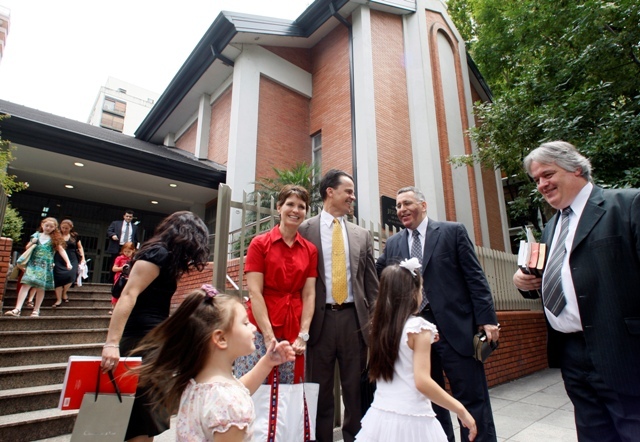 Mormons are ebullient and develop personal relationships with others in the ward, so they are simple glad to see each other; there are often a large number of young children in the congregation; since all Mormons have callings in the Church, there are things to discuss; and Mormon meeting houses are plain and bright, unlike cathedrals whose architecture encourages reverence. However, Mormon leaders constantly remind the Saints about their ebullience, and there is always reverence while the sacrament is being passed. RM: Abbreviation for returned missionary. Sabbath: When God created the earth, He rested on the seventh day and commanded us to set that day aside to worship Him. The Sabbath moved to Sunday, the first day of the week, after the resurrection of Jesus Christ, which occurred on Sunday. Mormons refrain from work and play on Sundays. The block of Sabbath meetings lasts for three hours, and often there are callings to fill at other times during the day. In Israel, Mormon branches meet on Saturdays, and in Egypt on Fridays, keeping the spirit of the law. Sacrament: Instituted by Jesus Christ at the last supper. Today, Mormons partake of bread and water that has been blessed in remembrance of Him. While taking it, members renew their covenants made at baptism and reflect on the atonement of Jesus Christ. 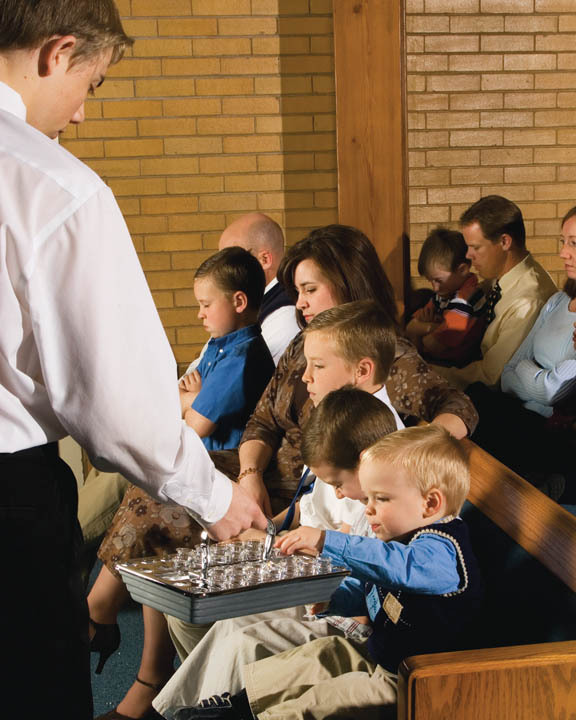 Sacrament Meeting: The main Sabbath meeting, whose central purpose is to partake of the sacrament. There are also spiritual messages, prayers, and hymn-singing. Sacrifice: With obedience, a foundational principle of the gospel. A person who qualifies for exaltation is willing to sacrifice all earthly things for the gospel. There is no coercion involved with sacrifice, only the example of those who have gone before who have been willing to give so much to serve God. Sanctification: To become clean, pure, and spotless (Doctrine and Covenants 20:31-34). “…and if by the grace of God ye are perfect in Christ, and deny not his power, then are ye sanctified in Christ by the grace of God, through the shedding of the blood of Christ, which is in the covenant of the Father unto the remission of your sins, that ye become holy, without spot” (Moroni 10:32-33). Savior: The Father sent His Only Begotten Son, Jesus Christ, to be the Savior of the world, not to save people in their sins, but from their sins (Alma 11:37-45). School of the Prophets: The School of the Prophets was set up by Joseph Smith in Kirtland, Ohio, during the winter of 1832-33 to instruct the leaders of the Church in the doctrines of the kingdom. The school continued for some years. Another School of the Elders was established in Jackson County, Missouri, and conducted by Parley P. Pratt. Science: Truth is truth, and when all scientific fact is known and all religious truth is known, they will perfectly match. Scriptures: Words written by those with authority and through the inspiration of the Holy Ghost. Mormons accept as scripture the Holy Bible, the Book of Mormon, the Doctrine and Covenants, and the Pearl of Great Price, often referred to as the Standard Works. Sealed Book: When Joseph Smith received the gold plates from the Angel Moroni, part of the book was sealed, and the Prophet was forbidden to translate from the sealed portion. It will come forth at a later time, when men are worthy to receive it. Isaiah prophesied of a sealed book (Isaiah 29:11-12). Sealing: Mormons who marry in the temple are “sealed” for time and all eternity, meaning their marriage will not end at death, but can continue forever. In addition, their children will be theirs forever. Second Coming: Jesus Christ’s return in power and great glory to reign on the earth through the Millenium. No one knows the day or the hour of Christ’s return, not even the angels in heaven, however, the signs of the times will prompt His followers to watch for Him. Seer: A seer is a revelator and a prophet who can know of things which are past and things which are to come. (See Mosiah 8:15-18.) The president of The Church of Jesus Christ of Latter-day Saints is a prophet, seer, and revelator. Seminary: A four year religious education program for high school students. Classes are held on school days, either during or before school. Students who live too far from a program may do home study. 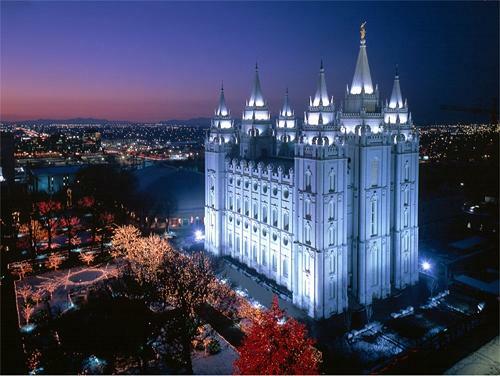 Seventy, the: A priesthood office with special responsibility to teach the principles of the gospel under the direction of the Quorum of the Twelve Apostles. The first and second quorums of the Seventy are General Authorities and may serve throughout the world. Set Apart: A blessing given by the laying on of hands by an authorized priesthood holder. Given to officially assign a member to a specific church calling (assignment) and often promises and spiritual gifts from God to help the member carry out the work. Signs of the Times: Events prophesied to precede the Second Coming of Christ. Some are found in the Bible, especially the Book of Revelation; others are found in the Book of Mormon and the Doctrine and Covenants. Modern prophets have also prophesied various events. Sin: Any behavior contrary to the will of God. However, the knowledge of right and wrong, and a knowledge of the laws of God are necessary to commit sin (James 4:17). A man sins when he violates his conscience, doing the opposite of what he knows to be right. Singles Ward: A congregation for young unmarried Mormons, often meeting near a university. Sister: A female member of the Church; a title designed to help members remember they are all part of God’s family. The title used, with the surname, when addressing a full-time female missionary. Sister Missionary: A woman serving an eighteen-month full-time mission for the Mormons. Sons of Perdition: Those who, despite having received a sure knowledge of Christ, deny Him. They are not redeemed by the atonement and cannot attain any level of heaven. Spaulding Manuscript: Sometimes anti-Mormons claim that Joseph Smith plagiarized the material in the Book of Mormon from the “Spaulding Manuscript.” Sidney Rigdon was supposed to have helped by inserting the doctrinal portions. However, the Book of Mormon was already published when Sidney Rigdon first met Joseph Smith. The Spaulding Manuscript wasn’t found until 1844. In 1886 the Deseret News published the entire manuscript. There are no similarities between the two writings. Spirit Children: All of us, in our pre-earthly existence, were the spirit children of God the Father. Spirit Paradise: The portion of the Spirit World where the righteous dwell. Missionaries from among the righteous teach and minister to those in Spirit Prison, who then have a final opportunity to accept or reject the gospel of Jesus Christ. Spirit Prison: Part of the Spirit World. After death, those who died without learning the gospel of Jesus Christ or were disobedient during their lives and had not repented are assigned temporarily to Spirit Prison to be taught and to wait for the resurrection. Those who willfully refused the saving power of Christ on earth suffer there for a time for their own sins. Those who repent can dwell with the righteous in Spirit Paradise. Spiritual Death: Separation from God. Also called the “second death,” with the first being physical death. Stake: A geographical division similar to a Catholic diocese. It contains a number of congregations, known as wards, and is led by a stake president and his two counselors, who are assisted by a high council of twelve priesthood holders. Stake Center: The building that houses the stake offices, while also serving as a regular meetinghouse. It is often larger than other chapels to accommodate large stake activities. Stake President: The Melchizedek priesthood holder who oversees a stake, a geographical group of congregations. He is assisted by two counselors and a High Council of twelve priesthood holders. Standard Works: The official scriptures used by Mormons: The Holy Bible, the Book of Mormon, the Doctrine and Covenants, and the Pearl of Great Price. Stewardship: Those areas of our spiritual and temporal lives that are our special responsibility, including church assignments, family, community, and the environment. Stick of Ephraim: The Book of Mormon. (See Ezekiel 37:15-28.) It is a record of God’s dealings with a remnant of the tribe of Joseph. Stillborn Children: Stillborn children are not recorded as births and deaths on the records of the Church, but it has been the opinion of modern prophets that they are resurrected and exalted as are infants who die, according to “the mercy and justice of that Infinite Being in whose divine economy nothing is ever lost” (Joseph F. Smith et al, Man, His Origen and Destiny, p. 354). Sunbeam: A class in the Children’s Primary auxiliary for children who will be four by the end of the calendar year. It is the first regular class after the nursery. Children are taught basic gospel principles and stories from the scriptures. A popular song teaches children Jesus wants them to be a sunbeam and shine for Him each day. Sunday Dress: Mormons wear the best clothing they have to church, in order to show honor and respect to God. For women, this generally means wearing a dress or skirt, and for men, a sports coat, white shirt and dress pants. However, people who do not have these pieces of clothing are welcome to come in whatever their best happens to be. Proper dress may vary by culture. Sunday School: A forty-minute class held each Sunday for members ages twelve and up in which members study a specific book of scripture each year in a four-year rotation. Special classes are also held for investigating or new members or to study special topics. Sustain: A promise to support a person assigned to a specific church position. When the assignment is announced in church, members raise their right hands to form an angle, signifying they understand the call came from God and they will offer him or her their full support.